My painting of Eric’s latest album cover. So in the car I listen to XM radio the highway channel 59. I was listening the other day and a song came on the radio. It was odd because I heard the song before but I never heard the voice. I sang along because it was a huge Lady Antebellum hit that I was acquainted with. The song Friday Night. Stormy Warren came on to announce that it was Eric Paslay. Well, I never heard of him but his voice was a nice contrast to the Lady A version. I did some research and found out Eric Paslay was born in 1983. In mid-2011 he signed to EMI records in Nashville and released his debut single, Never Really Wanted. Well I never heard that song or I thought I never heard that song. So I decided to YouTube it. As I started listening to it, I remembered the song! I was surprised that he sung it because I was surprised with such a good song I didn’t remember him. When country artist inspire me I like to write about them and paint a picture of them. So I painted a picture of Eric and sent it through a Facebook message to him. It took some time but his team got back to me and thanked me for the picture and wished me luck in my adventures. Also, they chimed me in that Eric Paslay originally wrote Friday Night but Lady A just released it before he did. He also co-wrote Barefoot Bluejean Night for Jake Owen. As well as Even if it Breaks your Heart for the Eli Young Band. 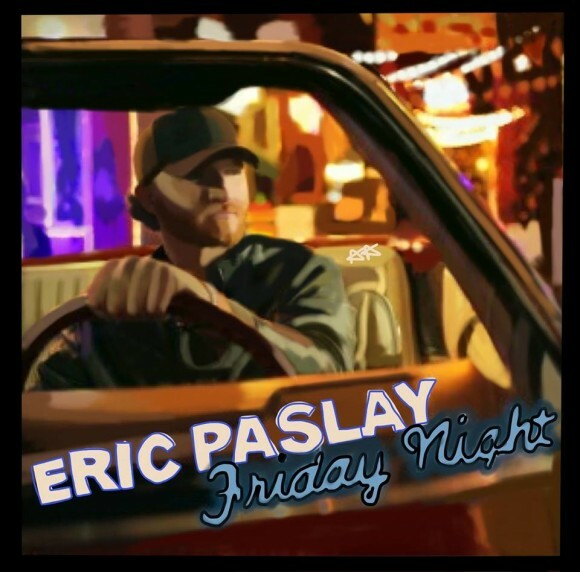 Eric Paslay is a new comer but with his writing abilities and talent I believe he will be around in the industry for years to come. Check out some of his music. We can tell his Friday Nights got a little better since he released that single and hopefully listening to his song will make your Friday nights better as well.